From the time they enter school, students are often asked, "What do you want to be when you grow up?" 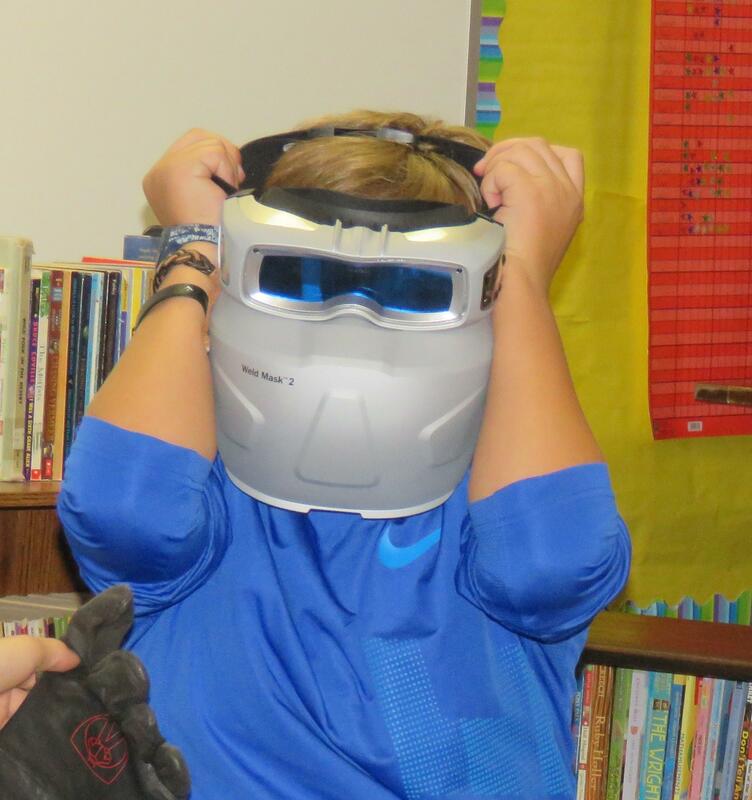 With the help of some professionals who volunteered their time, Page fifth graders got a glimpse into what certain careers might look like, what education is needed, and how students can pursue their goals. The Page Career Fair has been offered at TK Schools for more than 20 years and many of the dedicated volunteers look forward to returning year after year. 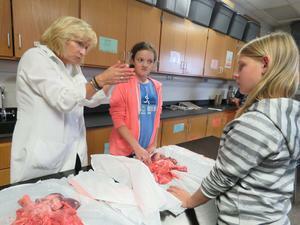 Dr. Jayne Courts amazes students when she inflates pig lungs and lets students feel and touch the lungs and heart. "Students love the hands-on stuff," she said. This year's career fair brought in 18 guest speakers for two afternoons. Students were allowed to choose three sessions to attend each afternoon. Barry County Judge Mike Schipper set up a mock trial as part of his session on being a judge. Jake Bauer, a welder with Holland Brewing, gave students the chance to try on some of the protective equipment he needs to wear while he does his job and explained the amount of schooling he needed. 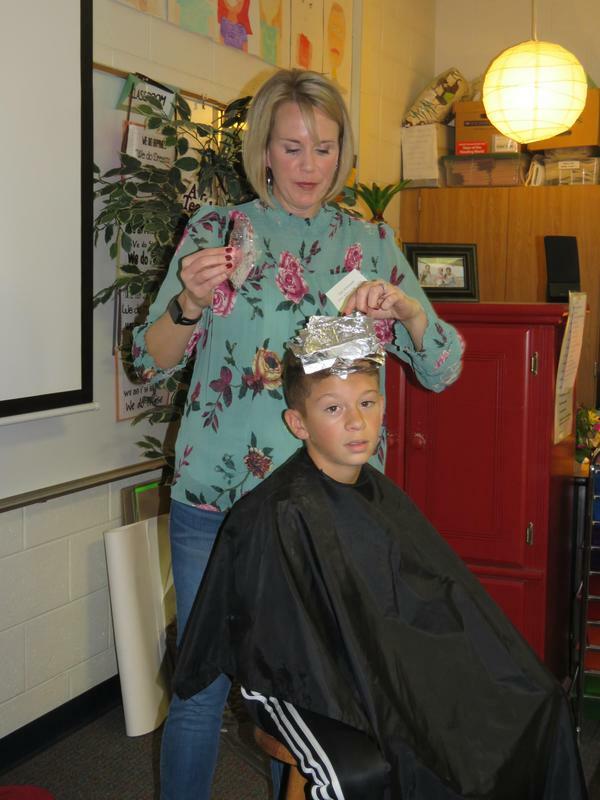 Isaiah Boafo sat patiently in front of his fifth-grade classmates while Jean Wisniewski of Lox Salon prepared his hair for some bright and colorful highlights. From firefighters to a photographer and many more careers, experts shared how they got their jobs and why they liked doing what they do. Dr. Becca Kursch of South Kent Veterinary Hospital excited students as she talked about the many pets she's seen with unique injuries. 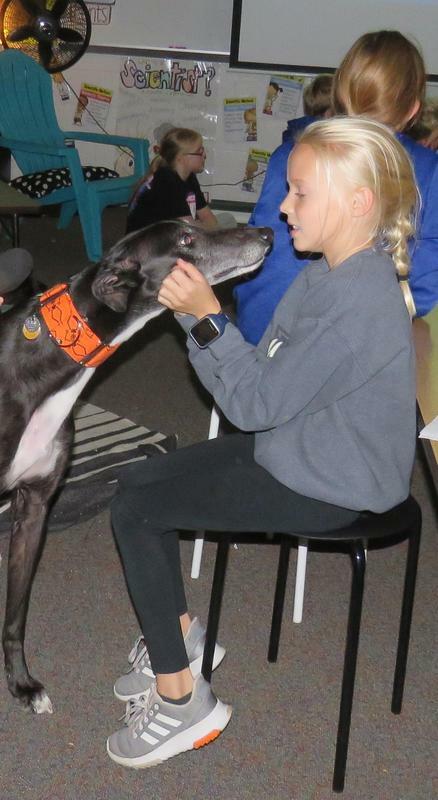 Her two rescued dogs also attracted a lot of attention as they wandered through the classroom eagerly accepting attention from students. 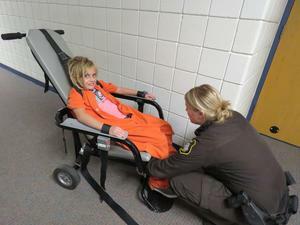 Fifth-grader Isreal Sherk donned a bright orange jumpsuit and voluntarily allowed herself to be restrained in a special chair to demonstrate some of the tools the Sheriff's Department needs to use to restrain and confine inmates. Speakers also talked with students about the importance of finding a career they enjoy, then doing the best they can at whatever job they choose. Presenters this year included Cade Dammen a project manager with Owen-Ames-Kimball construction; Sheriff Dar Leaf; Monique Joseph, director of Caledonia Dance and Music Center; Don Williamson, artist; Matt Dykstra, Pierce Cedar Creek environmentalist; Reagan Gielincki, occupational therapist; Jake Bauer, Holland Brewing welder; Thornapple Township Emergency services personnel; Tami Barnes, senior staffing and training specialist with Viking Corporation; Lindsay Vertalka, physical therapist; Lydia Feuerstein, Brann's restaurant manager; Jordin Desscoahers, Spectrum Health dietician; Mike Schipper, Barry County District Court Judge; Eric Hannapel, orthodontist; Dr. Becca Kursch, South Kent Veterinary Hospital; Steve White, photographer; Jean Wisniewski, Lox Salon, and Jayne Courts, medical doctor.